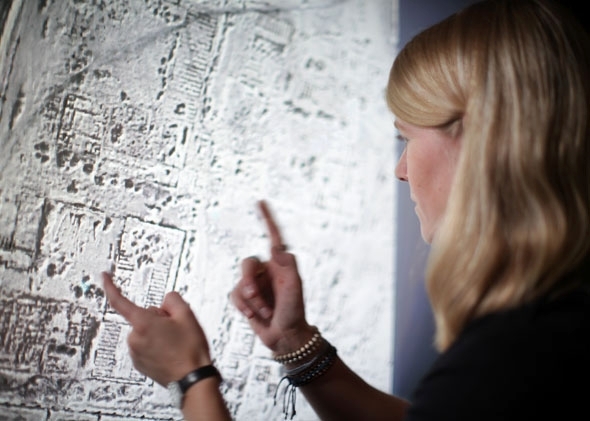 Dr. Sarah Parcak uses satellite imagery for archaeological research. Photo courtesy University of Alabama at Birmingham. I like a good archaeological adventure (I’ve had many), and it would have been amazing to be part of the expedition that discovered Machu Picchu in 1911. But what if Hiram Bingham had the technology to find hundreds of other archaeological sites at the same time and create entire 3-D maps of the ancient landscape accurate to within a few inches? This is called space archaeology. And it is happening right now. That’s why I believe today is the most exciting time in history to be an archaeologist. Space archaeology refers to the use of space- and air-based sensor systems to discover ancient settlements, cultural remains, and natural features (like relic river courses) otherwise invisible to the naked eye, or hidden due to vegetation and water. Archaeologists use datasets from NASA and commercial satellites, processing the information using various off-the-shelf computer programs. These datasets allow us to see beyond the visible part of the light spectrum into the near, middle, and far infrared. These spectral differences can show subtle differences in vegetation, soil, and geology which then can reveal hidden ancient features. Satellite datasets like WorldView can see objects as small as 1.5 feet in diameter. In 2014, WorldView-3 will be able to see objects a small as a foot. Another important sensor system is LIDAR (which stands for Light Detection and Ranging). LIDAR uses lasers to scan terrain in fine detail and even penetrate dense rainforest canopy, allowing archaeologists to see beneath the trees to reveal features of interest, from large monuments to small, subtle remnants of ancient homes and road systems. These are images of the famous New Kingdom (ca. 1800 BC) Harem town of el-Gurob, Egypt. In the before, very little is evident besides the remains of a large rectangular palace. In the processed infrared high-resolution image, you can see the entire town to the north of the palace—elite villas, a street, and other structures. Photos courtesy University of Alabama at Birmingham. Then the real fun begins. Once archaeologists have shown possible “new” ancient features, they can import the data into their iPads and take it to the field to do survey or excavation work. Technology doesn’t mean we aren’t digging in the dirt anymore—it’s just that we know better where to dig. Using this technology, archaeologists have found many thousands of previously unknown sites. I’ve used satellite datasets in Egypt—I believe we have still found less than 1 percent of its sites—to show ancient settlements, tombs, and even some potential pyramids. We collaborated with a French team at the site of Tanis to test high-resolution imagery that showed nearly the entire layout of the ancient city. So far, we’ve confirmed one elite house. Across the globe, archaeologists are making amazing discoveries from satellite and aerial imagery (including Google Earth). 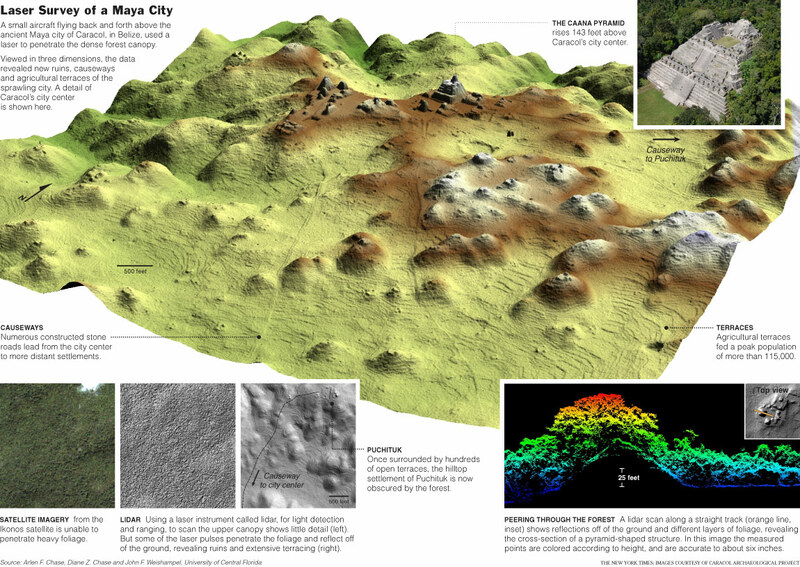 A team working at the famous Mayan site of Caracol have shown hundreds of new structures using LIDAR data. In Syria, archaeologists have revealed thousands of previously unknown settlements. In Cambodia, LIDAR data recently revealed an entirely new ancient settlement deep in the rainforest. We are also now able to map patterns of archaeological site looting from space. The high resolution imagery shows looting pits, which have a distinct shape compared to excavation units. In Egypt alone, we’ve seen looting increase more than 500 percent since the start of the Arab Spring at some well-known sites (including Saqqara, Dashur, and el Lisht). So, is the fun of archaeology now gone? I say that things have only gotten more exciting. What “fun” is there in randomly searching for features or sites, hoping that, perhaps, you might locate something? It is far more beneficial (and much better science) to archaeology to know exactly where to go and look. Also, with funding and time restrictions, we need to be much more efficient. As it turns out, the great age of archaeological discovery has only just begun.